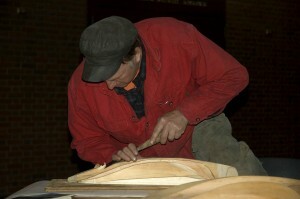 On Sunday afternoon, April 21st, the Lowell Folklife Series will present an intriguing program featuring three master craftsmen. Joining us will be National Heritage Fellow and shipwright Harold A. Burnham, noted maritime historian and ship modeler Erik Ronnberg, Jr., and Greg Bover of CB Fisk, Inc. With hand-crafted models up on stage, they will talk about the role of model-making in the building of world class pipe organs, 60-foot wooden schooners, and historic miniatures of seafaring vessels. 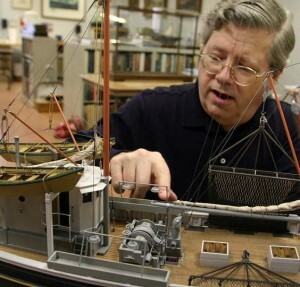 For Burnham, a half-hull ship model is a design tool. 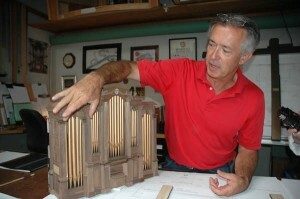 Bover’s company, CB Fisk, Inc., creates scale models to ensure that each pipe organ complements the architecture that surrounds it. For Ronnberg, the full-hull ship model is a historical representation, a form of visual storytelling. All three individuals are well-known to each other, and hold each other’s skills and knowledge in high regard. Their discussion will no doubt be full of fascinating details, tricks of the trade, and little-known facts about the importance of model-making. This event is free and open to the public. It will take place in Lowell National Historical Park’s Visitor Center theater on Sunday April 21, 2013 at 3:30 p.m. For more information, visit www.nps.gov/lowe or call 978-275-1719.